With Hershey Lodge, The Hotel Hershey, and Hersheypark Camping Resort available for Guests, you are guaranteed to find a place that suits whatever vacation experience you want or budget level you may have. During my visit I stayed at the Hershey Lodge. Hershey Lodge is absolutely beautiful, the wood beams and stone throughout the Lodge give it a very cozy welcoming feel. There’s an adorable Kids’ Check-In where your little ones can stay and play while Mom and Dad are checking in. The rooms are spacious and decorated with some very unique touches. (like Hershey Kisses on the wallpaper pictured above) The Lodge has a Health and Fitness center, Basketball and Tennis courts, an 18 hole miniature golf course and so much more. This summer Hershey’s Water Works, a huge Indoor Pool Complex will open at Hershey Lodge. Guests will enjoy sliding down a “Twizzlers twists” slides, Reese’s Water Walk, and splashing around in a Zero Entry Pool! It’s going to be a great place for year round fun! There’s also some fantastic dining options at the Lodge; Hershey Grill (order the S’Mores French Toast for breakfast…you won’t regret it! ), Lebbie Lebkicher’s, The Bear’s Den, and The Forebay offer a wide variety of menu choices and are all family-friendly! During my visit, I had the chance to see a portion of The Hotel Hershey. The Hotel was built in 1933 and is one of America’s landmark hotels. The minute you arrive you can tell that the Hotel is going to be luxurious. From the beautiful mosaic tile fountain to the magnificent grounds surrounding the Hotel, you can see that a lot of thought and care went into each gorgeous detail in this Resort. On the property, there’s an 18 hole putting course, Fitness Center, heated outdoor aquatic center, indoor pool, and an outdoor recreation complex. 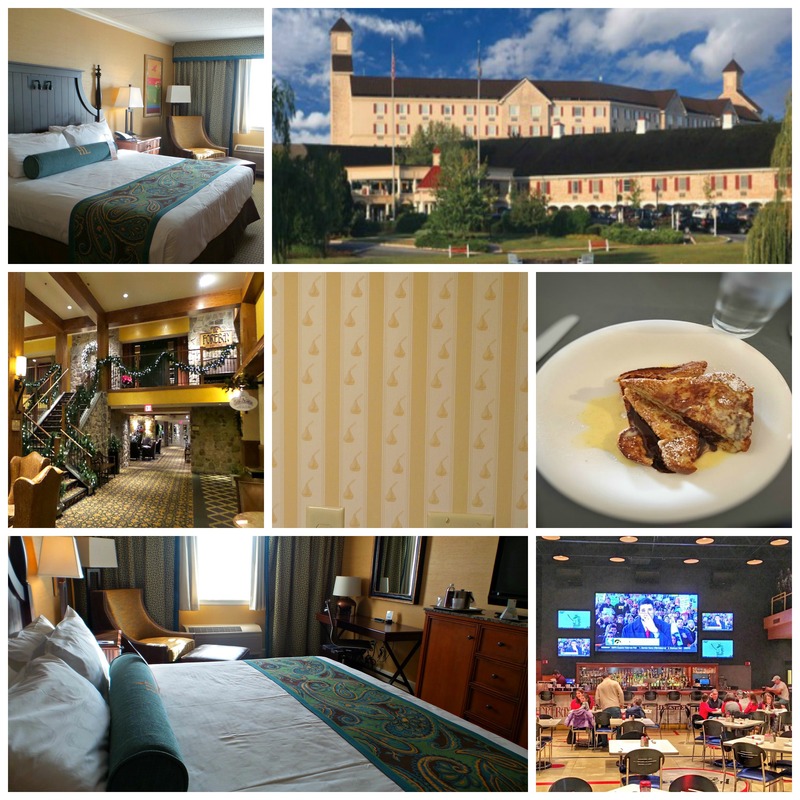 Also at The Hotel Hershey, there are 3 restaurants, a lounge, and a coffee/pastry shop, lots of boutiques to shop in , and The Spa at The Hotel Hershey also known as The Chocolate Spa. (which I will talk about later in this post) I had the chance to dine at The Circular while there and the food and atmosphere are amazing! The circular shape of the restaurant was inspired by Milton Hershey’s desire to not have a single bad seat in the place….and believe me, there’s not. There is a wonderful view of the Hotel grounds no matter where you sit! 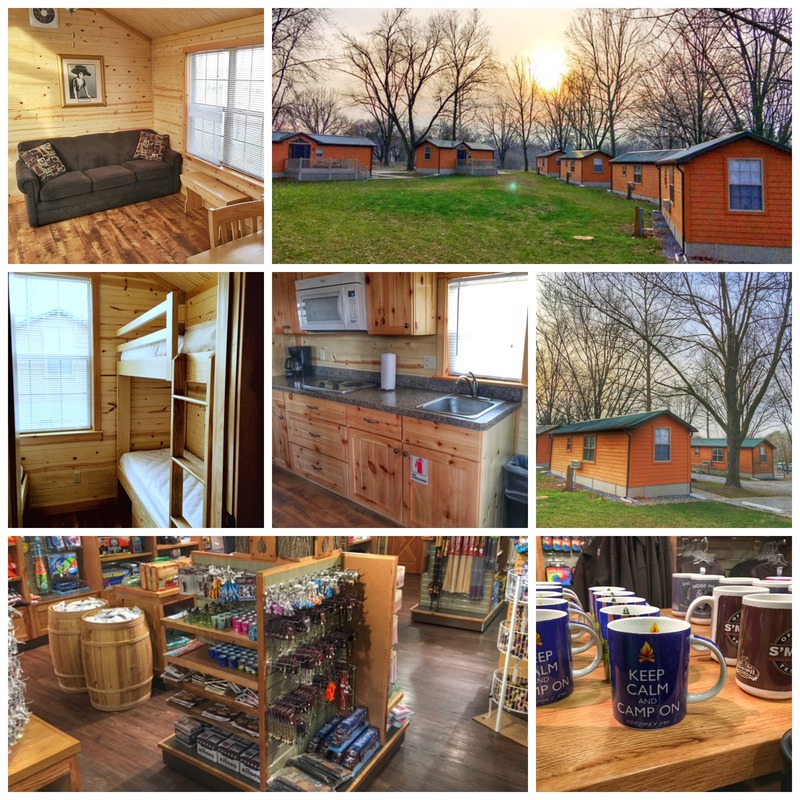 If you like camping or “glamping” Hersheypark Camping Resort is for you! You can choose from Deluxe Cabins (pictured above), Log Cabins, or stay at an RV or Tent campsite. Guests have access to a Country Store, two swimming pools and a kiddie pool, an Indoor game room, Horseshoe pits, Basketball, volleyball, and shuffleboard courts, Movie nights and much more! Hershey Trolley Works Trolley Tour takes you on a historical tour in the town of Hershey. You’ll hear the story of Milton Hershey and how America’s Sweetest Town came to be. 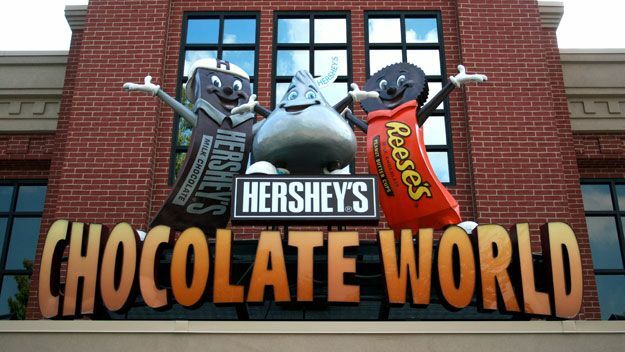 You’ll get to visit the main sites in the town of Hershey…all while enjoying delicious chocolates throughout the tour. The view of Hersheypark from “Welcome to Hershey “hill is stunning and you’ll be fascinated by the story of Milton Hershey. I left the tour wanting to learn more about him and his many philanthropic endeavors. ZooAmerica is a year-round, 11-acre, walk-thru zoo that’s right next to Hersheypark. 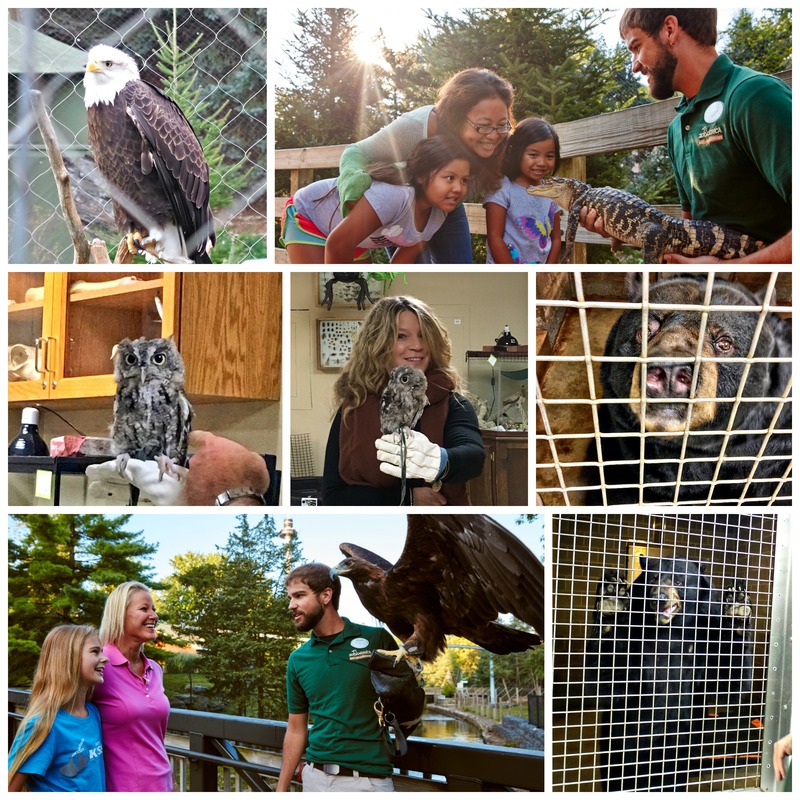 You’ll have the chance to see & learn about more than 200 animals from five regions of North America. They offer group educational programs and tours as well. I had the chance to go behind the scenes and meet some of the animals. I have to say, it was one of the most awesome experiences I have ever had. The owl I am holding in the picture above is named Mumford and he was rescued by ZooAmerica. I also got the chance to meet a baby American Alligator and feed a bear…yes, I said FEED A BEAR!! ( the bear was inside an enclosure and I was on the outside so it was perfectly safe but still, how cool is that?!!!) I highly recommend a Guided Tour or an Animal Encounter presentation. 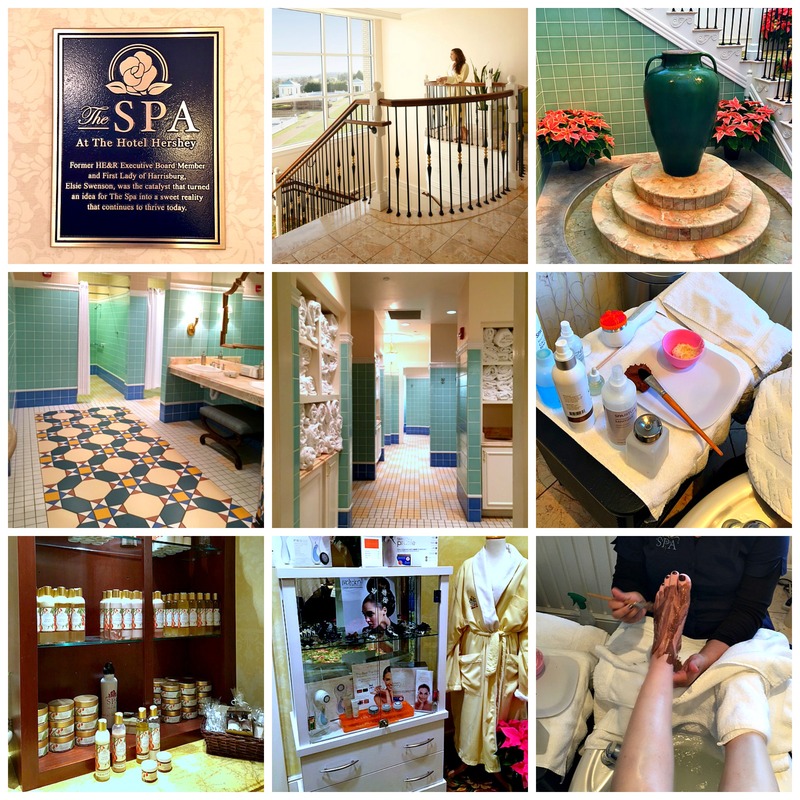 The Spa at The Hotel Hershey, also known as Chocolate Spa, is one of those places you never want to leave. It has 53 treatments rooms and is famous for its signature chocolate treatments. It also offers traditional spa treatments as well. I was treated to a “Sweet Feet” pedicure treatment while I was there and it was heaven! The chocolate sugar scrub and then the chocolate mask that were part of the pedicure were truly a “treat” in every sense of the word! It was a relaxing and rejuvenating afternoon. I can’t wait to go back and experience some of the other treatments and services the Spa has on their menu. Chocolate Spa is a great place to go for a girlfriend’s getaway or for a romantic getaway or anniversary celebration. 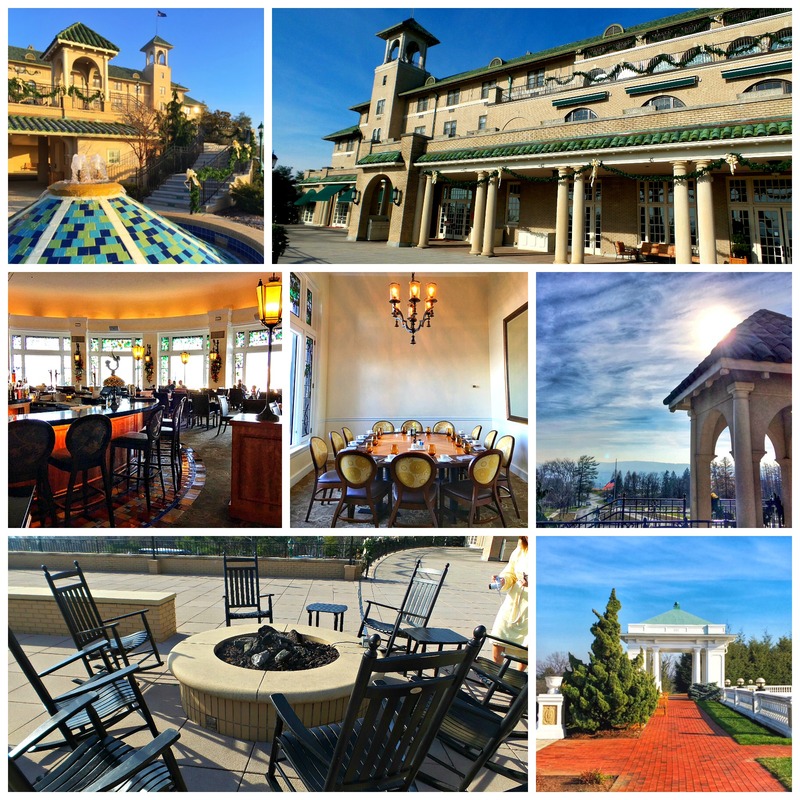 You do not have to be a Guest at The Hotel Hershey in order to enjoy the Spa. 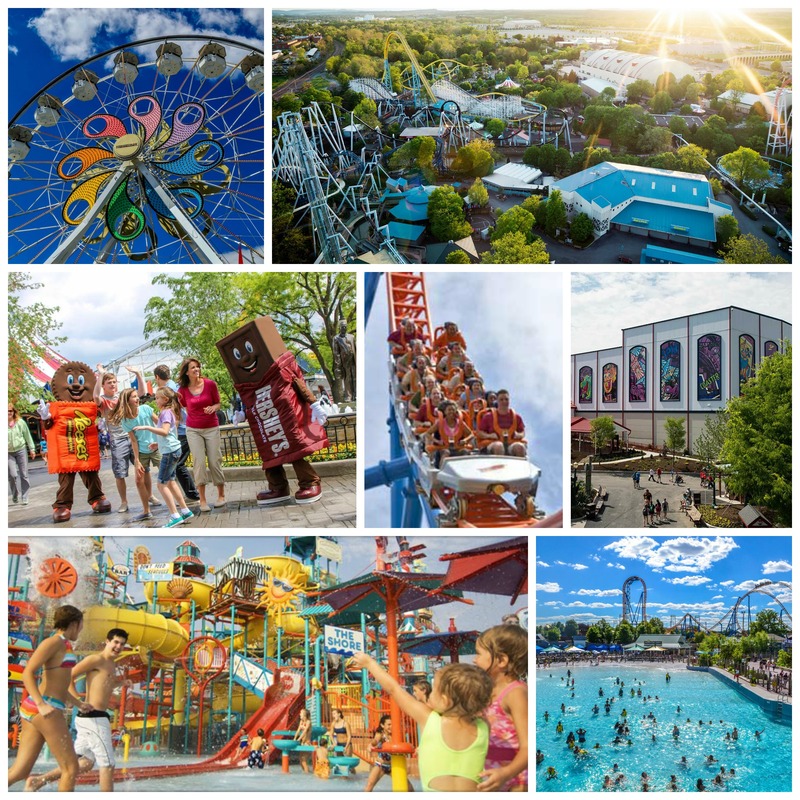 With over 70 rides and attractions Hersheypark has something for everyone! It truly is a park for every age and every stage. My family has been visiting Hersheypark since my kids were little. The kiddie area has over 20 rides and was a dream come true for me when I had 3 kids under the age of 5! As my kids have grown, they have loved the thrill rides and roller coasters. They can’t wait to ride LaffTrakk, Hersheypark’s newest indoor coaster. I had the chance to ride Laff Trakk during my visit and it was so much fun! Parks admission includes access to all the rides, attractions, and entertainment, as well as The Boardwalk at Hersheypark, a five-acre waterpark inside the boundaries of Hersheypark. Admission also includes entry to ZooAmerica. I love Hershey! I don’t live that far from there and we love going. Wonderful idea for this summer. Thanks so much for sharing. Omg we just love Hershy PA! Swear hubby and I love it not that our kiddo 😉 always a blast! To be honest, I never tried anything from their range yet and I have no idea why. Think I need to spoil myself this weekend with some chocolate. If finances allowed it, I would definitely go. This is a place I have always wanted to visit. What a fun place to visit. I would love to bring my family there one day. I have a friend who went to Hershey a few years ago and she has talked about how wonderful it was for so many years. We had hoped to meet each other there one of these years! I LOVE Hershey Park! Growing up we would go each winter and my favorite thing to do was watch the Hershey kisses be made. That is such a cute Owl. I would love to go on a vacation to Hershey. The hotel looks so nice and comfortable. Sounds like a fun place to visit and I do want to travel more this year. My daughter has only driven through the area when she was little so I would love to take her back to see it! I’ve been to Hershey twice, but never stayed in town, we have relatives in Harrisburg. Thank you for all the great tips! Wow! This sounds so fun – I would probably try the cabins – those photos just look so dreamy. What was your favorite part? What a fun place to visit. You guys had so much fun. I would love to go there one day. I totally agree, Hershey is a lot of fun. We went there last summer and the kids had a blast! looks like this place is so fun to visit. I’m sure kid will love this ..and the chocolates whoah!!! 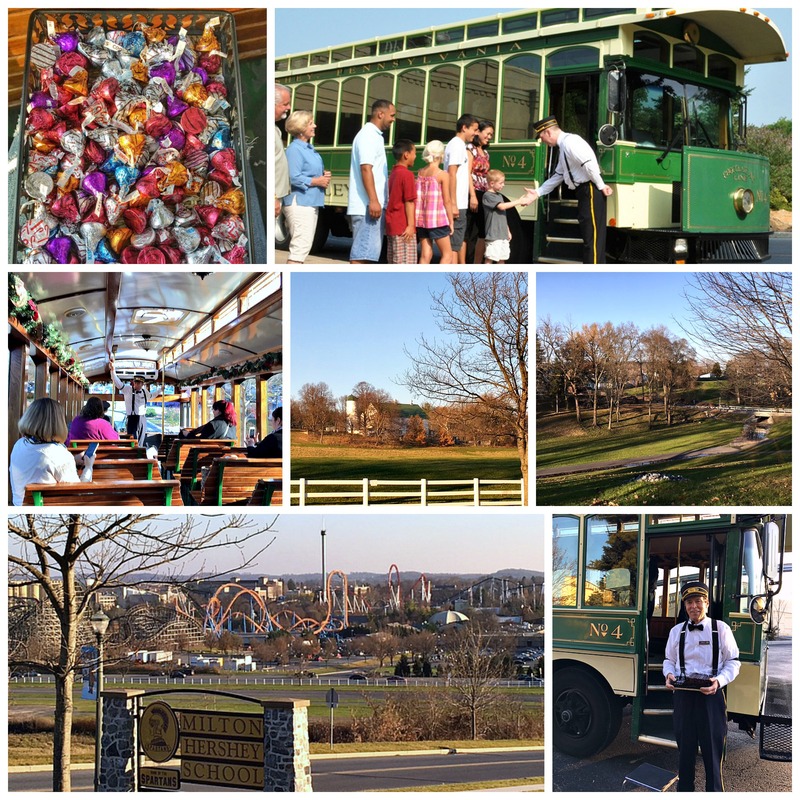 These are all great reasons to visit Hershey PA. which I would love to do some day. The lodge sounds like an amazing place to stay and the spa sounds better. Thanks for sharing the information about Hershey PA. which we are planning on visiting this year. I’ve heard so many great things about Hershey, PA but I haven’t been there yet. It’s definitely on my list of places to visit. This looks amazing and, oh my goodness, the food! I was under the impression that it would just be like a tour to the factory and that’s it. I did not expect the place to be this much fun! There are so many stuff to do and see, I love it! I want to see the chocolate world with my companion. I’m sure they would love it. Wow, this would be fun for the whole family. I wish I could go there with my family. I thought that Hershey’s is just all about chocolates. So they also have a great place to visit. It would be a lot of fun to go there for a day or two. We had a blast the last time we went! I think it goes without saying that my family would LOVE to visit Hershey because of the chocolate. But I didn’t know about ZooAmerica – I bet we’d love visiting there too! We’ll have to add it to our bucket list! ZooAmerica is awesome! Your kids would definitely love it! You had me at chocolate. Does the place smell like chocolate? I have always wanted to visit it has always been a fascination of mine. What an incredible cultural experience. so fun! it is absolutely on our list! This is a mix of the two things I love travel and chocolate! I live pretty far away from it but have always wanted to go I may have to set up a family trip to get there!